A super strong storage crate that will fit in the back of most fishing kayaks, including the Hobie Mirage range. 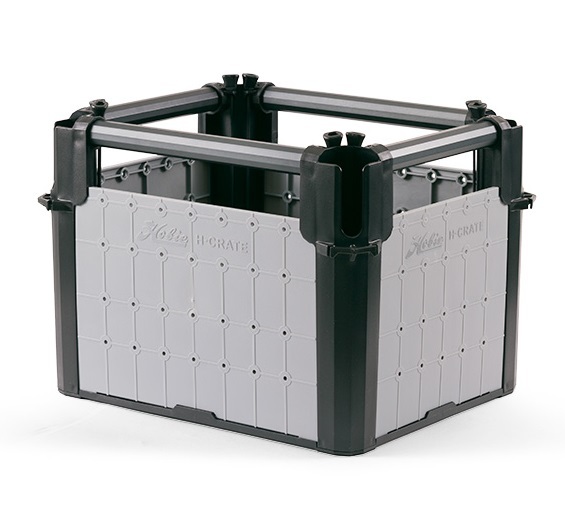 The Hobie H-Crate is superb for keeping your gear organised in your rear tankwell. The crate features 4 upright rod holders with built in bungee rod retainers. 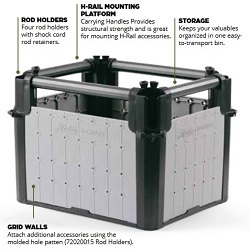 The grid walls of the crate have moulded in holes for fixing accessories, such as additional upright rod holders (72020015). The Crate also features H-Rail carry handles which also allows for even more accessories to be attached to the crate using compatible H-Rail accessories! The crate can be disembled and packed away flat for storage if required. Includes 4 tie down straps so that the crate can be securely mounted onto your kayak. 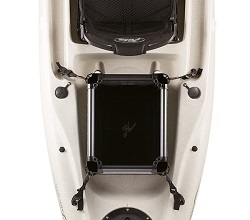 Skids pads on the underside of the H-Crate dampen sound and grip your kayak. A soft cover can also be added. We offer a delivery service for the Hobie H-Crate throughout the UK & Ireland to home and work addresses. Buy a Hobie H-Crate online from our website and collect from our shop in St Columb Road near Fraddon in Cornwall or you can collect from any branch within the Canoe Shops Group. There is no cost associated with instore collection*. Give us a call on 01726 862798 if you have any questions about the Hobie H-Crate.